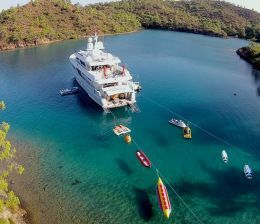 We enthusiastically recommend the route Bodrum , Gokova , Bodrum to our guests For one week yacht charter Bodrum in July and August where the weather is warm but humidity is low with Refreshing and constant winds favouring this area thus it is great for sailing and swimming, Since the soft cool breeze dries out the humidity and let you sleep like a baby… When we mention fresh winds it doesnt mean cold, nasty and strong winds but soft dry constantly refreshing air which flows from north – nothwesterly all the way from northern aegean which is very suitable for sailing and sleeping during hot july and August months where is almost impossible to sleep without airconditioners. 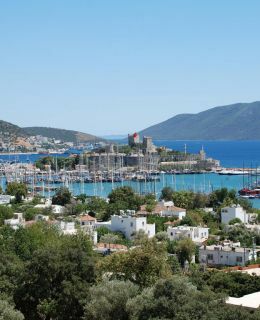 The bay of gokova has numerous coves to anchor and swim in chrystal clear waters, the beach restaurants and taverns are easily accessible from everywhere for a night out or to replenish fresh provisions at any time during your yacht charter Bodrum. We have got to wake up early this morning to serve you a calm and rich breakfast at Tuzla bay and hit the road again to longoz bay for lunch where you might want to swim And relax as we take you to English harbour for dinner and to Okluk bay to supply fresh water where famous Turkish traveler who sailed the world with a small traditional turkish gulet s/y Kismet, Sadun Boro has been padrino for a mermaid at the Entrance of Okluk bay where you can see a sad mermaid who is sitting on a rock and waiting for his return that is one of the most beautiful and well protected bays of Gokova . Looks like you have to prepare luggages from the breakfast on, who knows when we could see eachother again , gathering, money, time and group of friends to repeat what you have enjoyed so much… The captain and the crew is as saddened as you are , no one wants to make the first move to say goodbye however the transfer bus and your flight is waiting for you as planned and we hope to see you again next year , the world is small why not …?